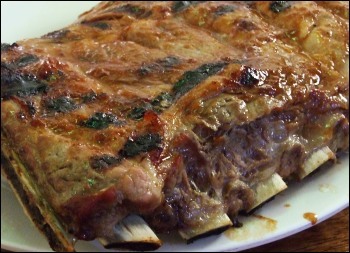 We hit a great sale on pork spare ribs the other day and decided to do a little barbeque with Country Bob’s Sauce. It was a success! We could have actually used MORE of the sauce as it came out a bit more subtle than anticipated, but dipping is good too. The interesting part of this is that when I was growing up, my mother never used BBQ sauce on her pork roasts or ribs – she only rubbed it with salt, pepper, onion, and garlic powder, which is delicious, but I’ve had to get more accustomed to BBQ sauce over the years. The best thing about using the Country Bobs is that it didn’t overwhelm the flavor of the pork, which is always my biggest complaint about BBQ. It complimented it nicely with a subtle sweet flavor, which always does well on pork.